Allen Interactions and Partners are Proud to Garner Learning Design Challenge Awards in Gamification and Microlearning. Minneapolis, MN (October 20, 2016)—Responding to Training magazine’s call for learning and development professionals to showcase their best practices in e-learning via the 2016 Learning Design Challenge (LDC), the leader in performance-changing custom learning solutions Allen Interactions And Partners Bright Horizons and Mary Kay earned awards in the Gamification and Microlearning categories. Participants were asked to submit a five-minute clip from their best e-learning programs in up to two of five categories—Gamification, Learning Analytics, Microlearning, Mobile Learning, and Social/Collaborative Learning—and detail how they met the specified criteria in the relevant category or categories. Submissions were open to vendors or corporate learning and development organizations. Applicants did not have to be present at Training’s Online Learning Conference held September 20-22 in Chicago, but were offered the opportunity to demonstrate their submissions throughout the event. 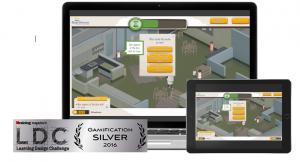 View the Bright Horizions Virtual Lab School: Health and Safety Game! “At Mary Kay Inc., we had a perfect opportunity to reimagine how education could impact new Independent Beauty Consultants in a more modern and relevant way said Kathryn Hunt-Siwald, Manager of Sales Education Materials and Strategic Education for Mary Kay. The trends of adult learning point toward the desire for more empowerment, more freedom, more flexibility, and more access to information when – and where – people want and need it. Additionally, adults are looking for untraditional learning experiences and technology is facilitating this as never before. Coupled with innovations in core business strategies within Mary Kay Inc., we had the perfect moment to create a seamless experience for the independent sales force. That’s why we partnered with Allen Interactions and are so honored that our partnership netted a Bronze Award in Microlearning – a category that beautifully fits within the strategic business needs of a new Independent Beauty Consultant to facilitate her success sooner, not later." View the Mary Kay Microlearning Course: Health & Beauty Sales! Training received 93 submissions, and 16 participants showcased their designs onsite at the Online Learning Conference. E-Learning expert Bryan Chapman—Chief Learning Strategist for Chapman Alliance and former Director of Research at Brandon Hall, who has had a longtime relationship with Training and its events—organized the program and facilitated a panel of judges. Judges’ evaluations represented 75 percent of the total score. Online Learning Conference (OLC) attendees voted onsite for their favorites for the other 25 percent of the score. Check the complete list of 2016 Design Challenge Award winners. After 23 years, Allen Interactions remains a top learning solutions provider, creating Meaningful, Memorable, and Motivational learning experiences to meet organizational business goals. With a focus on developing performance-driven learning events backed by the best instructional design and technologies, Allen Interactions is devoted to learning strategy consulting services and delivering innovative e-learning, gaming, mobile, and blended learning solutions that assist top performing organizations. Bright Horizons’® range of family and education solutions for every life stage helps employers address family and personal challenges, boost productivity, and win top talent. Our 900+ clients around the globe represent all industries and include 80+ Working Mother 100 Best companies. Mary Kay Ash, an entrepreneur and a philanthropist, started her business from a tiny store in Dallas, Texas with five products and one big dream. That dream was to inspire women to transform their lives, and in doing so, help other women achieve success. Today, with 3.5 million Independent Beauty Consultants, Mary Kay offers more than 200 premium products in more than 35 countries around the world.